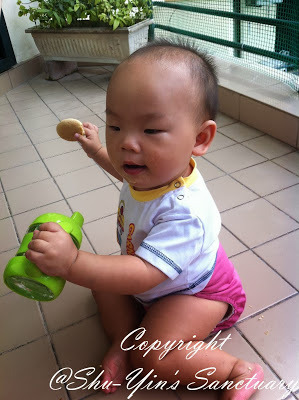 Most of you know that Khye had rejected milk bottles since he was a few months old. And I'd trouble starting Khye on solid. 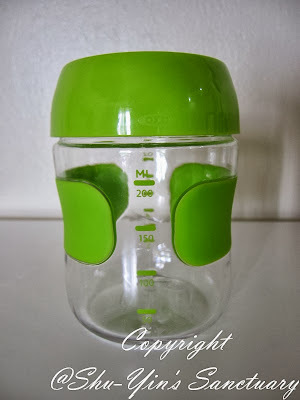 So when it comes to drinking liquid other than breastmilk, I'd wanted a good drinking/sippy cup that Khye like and would drink from. 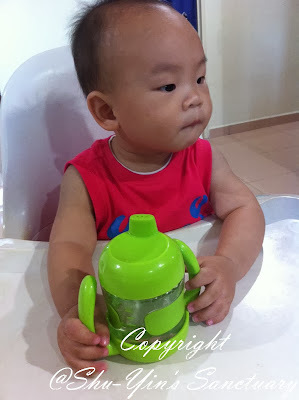 It was good when I had a chance to try out the OXO Tot Sippy Cup Set. OXO's mission is dedicated to providing innovative consumer products that make everyday living easier. 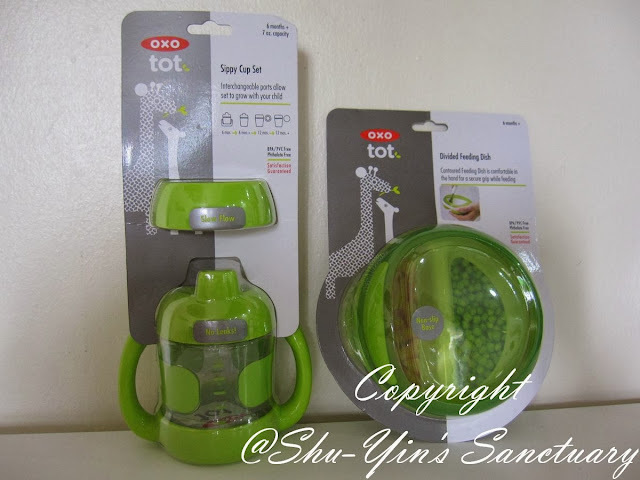 They have a range of products for Baby & Toddler called OXO Tot. 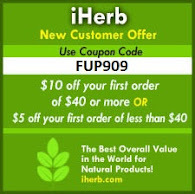 Looking at their website, I was immediately attracted to their many categories of baby and toddler products. Under the Feeding category, first thing that drawn to me was their Sippy Cup Set. First things first, the packaging. 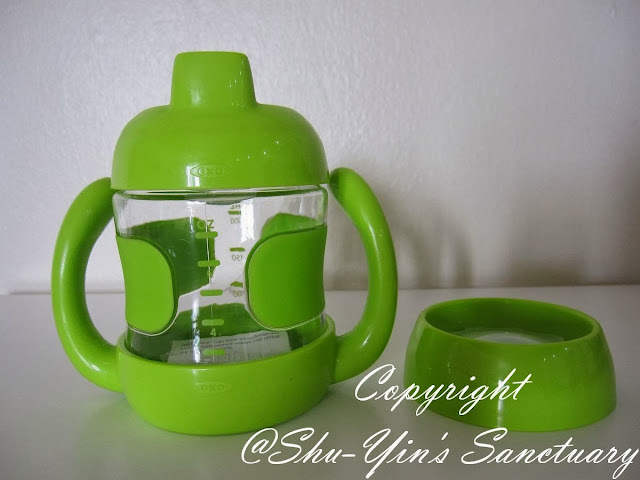 I received the Sippy Cup Set together with the Divided Feeding Dish (which I will review this later). It comes in a hard plastic like most utensils do, but the packaging was really very easy to open. There was no need for scissors to cut away the hard plastic. There was a perforated line surrounding the sippy cup. Simply pull the cupboard flap and it tore around the edge. Simply fantastic. I hated cutting up hard plastic which ends up poking me reallybad most of the time. So I was really appreciative of the packaging. 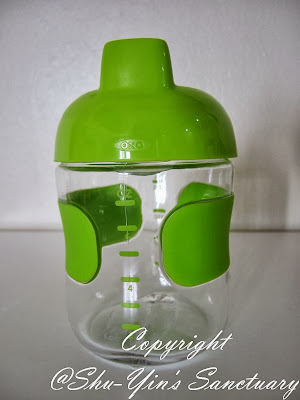 The OXO Tot Sippy Cup Set grows with your child from age 6 months and up. I am such a big fan of things that last and grow with the kids. It makes purchasing something like this worth the money as it lasts more than a mere few weeks or months. So simply by this fact, I was sold. Hehehe. This Sippy Cup Set is baby's ideal first cup. 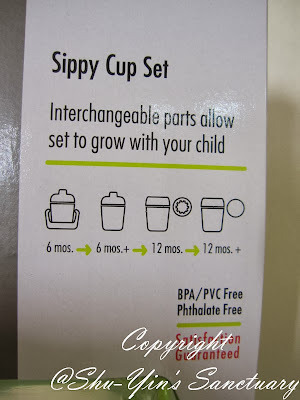 This diagram below shows you how this Sippy Cup Set grows with your child. 1. 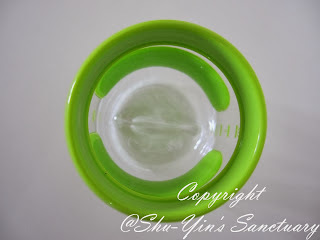 Firstly, use with the Sippy Cup Lid/Spout. 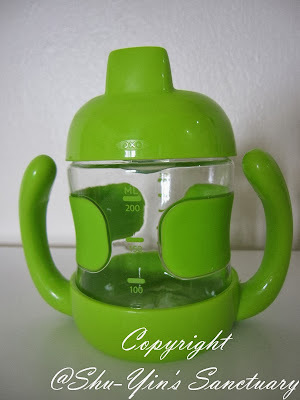 The air valve releases pressure for smooth sipping. 2. Fix it with the non-slip handles, which are perfect for little hands. 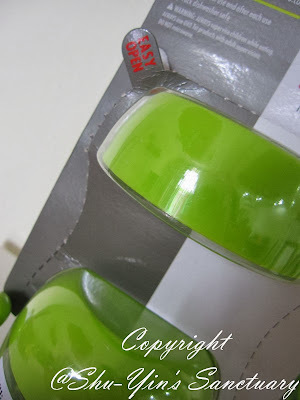 The handles are also angled, so babies don’t have to turn their wrists too far. 3. 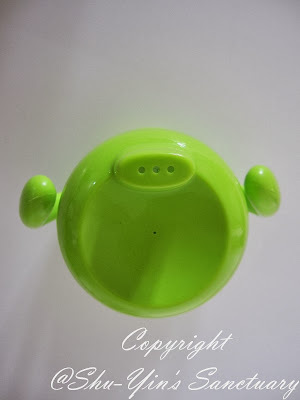 Handles are removable for when baby’s grasp develops. 1. 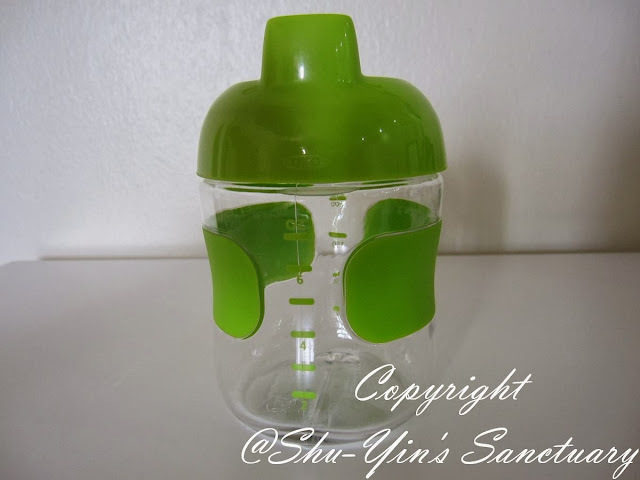 When baby is ready to transition from sippy to regular cup, remove the Sippy Cup lid/Spout and replace it with the OXO Tot Training Cup lid. 2. 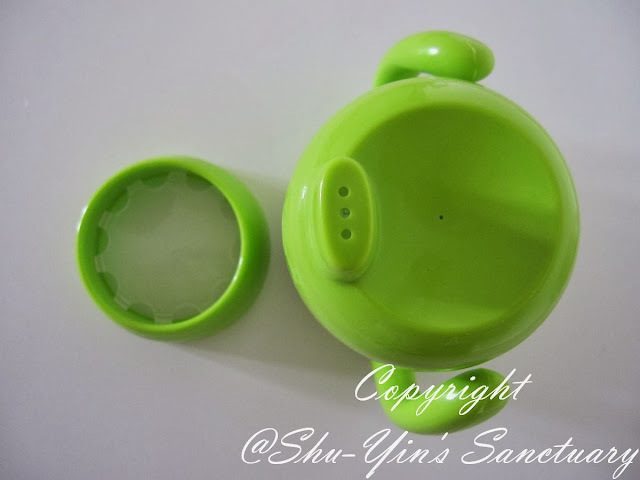 The Training Cup lid has a transparent insert with perforations around the perimeter to control the flow of liquid when the child tilts the Cup to drink. 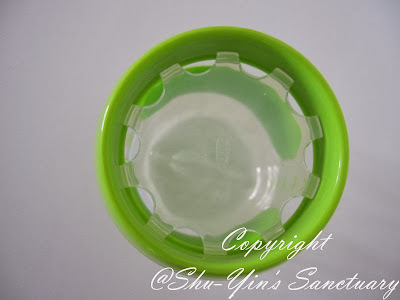 The translucent lid also allows the child to see the liquid coming. 3. When ready, remove the perforated insert and the Training Cup converts to a regular Cup. 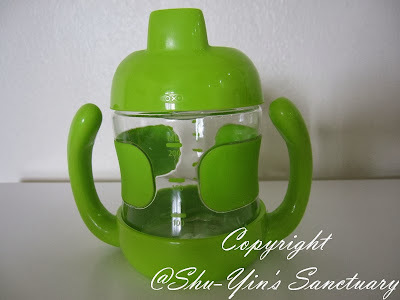 Besides all these, there are also many other good features of this Sippy Cup Set. To give an even more better gauge, there are measurement in both OZ and ML and I love it. 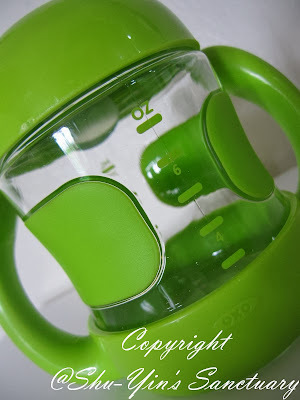 When it converts to a training cup, I love the green patches in the middle of the cup which are non-slip and makes it much easier for my child to grasp. 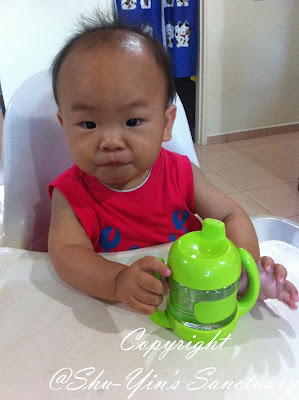 Khye although not too fond of milk bottles, was able to hold on by himself the sippy cup handles and sipped it alright with one hand, while holding his snack on the other. Perfect handles for little hands. 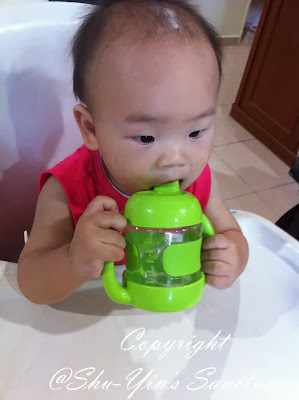 When he got bigger, he was able to know how to hold on to the sippy cup himself and put it into his mouth. 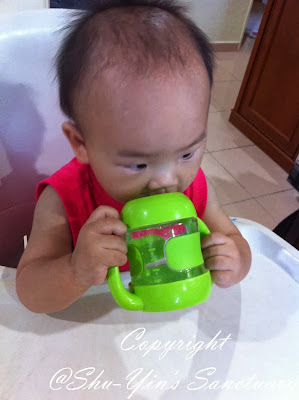 It will be a matter of time before Khye is ready to ditch the sippy spout and handles and uses it as a training cup. 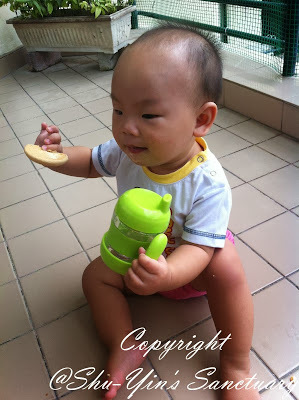 All in all, I think it is a brilliant product and perfect cup that will accompany Khye from baby until toddlerhood. Yes, until both him and I find the cup so boring because he uses it every single day for a few years. lol. 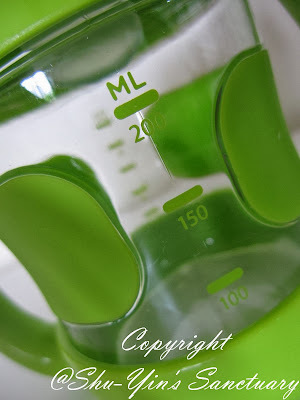 * Disclosure: I received a Sippy Cup Set 7oz for review purpose, but no monetary incentive was received. All text and opinions are of my own and represents my honest opinion of the product(s).